I bet a few of you still have some things knocking about after the Christmas holidays. Especially mandarins. As you may have noticed, last year was the year that I discovered the joys of combining desserts with herbs. People have been putting things like mint, basil and lemon balm in desserts forever. Last year, I mostly branched out into fennel, with my Rhubarb Foolish and Fennel and Strawberry Tarts. This year, I see no reason to stop experimenting. I got inspiration for this dish from taking a quick break from the Christmas prep and sneaking off for five minutes with a mandarin. I must have still had some dill on my hands from the Gravad Lax. What I ended up with was inspiration. This is a great combination, as if they were made to go together. The dill is actually pretty subtle in this, it somehow seems to enhance the mandarin flavour, making it really sing on your tongue. Mandarins can be a little bit hard to juice by hand. Well, hard on the hands anyway, as I found out last year when making marmalade. Their skins are so soft and thin, that if you have any number to juice, it becomes uncomfortable very quickly. If you have a fancy juicer, all well and good. 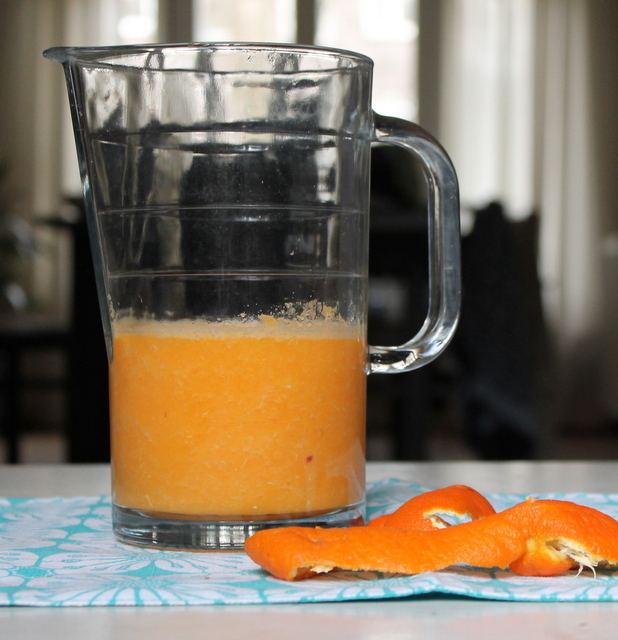 If not, and you ever have to juice a few mandarins, this tip will save you from feeling that you have juiced more of your hand than you did the fruit. Peel them, then bung them in a jug and juice them with a stick blender. Pour the resulting juice through a square of muslin. You can either leave it to drip through for a few hours, if you want a very clear juice; or you can squeeze it through straight away if you don’t mind a cloudier juice. In fact, I’m full of top tips today. When cleaning out the cupboards recently, I came across half a bag of badly-stored sugar, that had got a little damp at some point. As you know, I hate to waste food, so I kept this, knowing that I would find something that it would be suitable for. This recipe is just the thing, because it requires a simple syrup. I just put it in a ziplock bag, wrapped it in a couple of tea towels, and bashed out the lump with a hammer. It wasn’t fine sugar, but I could get the right amount out to melt gently into a syrup. Obviously, it would have been better not to abandon it to its fate in the first place, but I feel good that it didn’t go to waste. And talking of not wasting food, this recipe also uses another the things that I always have knocking around in my fridge or in the freezer – egg whites. I absolutely love sweet and savoury egg-based sauces, and make all manner of custards, hollandaise and fresh mayonnaises on a regular basis. I am always in need of recipes for egg whites. If you have more suggestions, please do share. As well as using up all the leftovers, this clean, bright and refreshing sorbet is the perfect antidote for the heavy and rich Christmas foods we have been eating recently. It is also a really easy recipe, to make, even if you don’t have a ice cream maker (which I don’t). 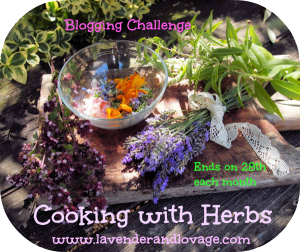 Coincidentally, this recipe really fits the brief for this month’s Cooking with Herbs, run by Karen at Lavender and Lovage, so I’ve entered it on her blog. 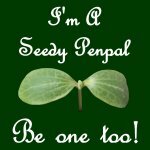 There are always so many great recipes there, so hop over with me at the end of the month to have a look. Wash and zest six of the mandarins, and juice all of them, using the handy method I outline above. Put the zest, sugar, water and dill in a saucepan. On a gentle heat, melt the sugar, and then bring to a boil. Once it is boiling, cook the syrup for a further five minutes, then leave to cool for ten minutes. Taste the syrup. At this point, you should be able to taste the dill quite well, but it does come after the less-subtle mandarin punch. If the dill is enough for you, set the syrup aside to go cold. If you are having trouble tasting the dill, add a few more sprigs to the syrup, before you set it aside. Once the syrup is completely cold, strain it through a fine sieve, add the juice, and make it up to a total of 600 ml with cold water, if it falls short. Pour the entire mix into a shallow container with a lid. An old ice cream tub is ideal. 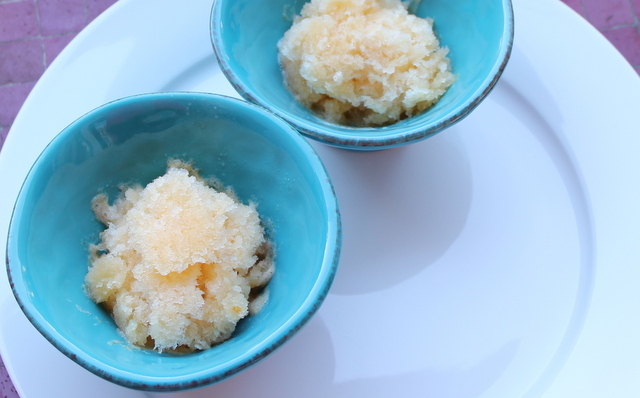 Freeze it for about 4 hours, until the sorbet is thick and syrupy. 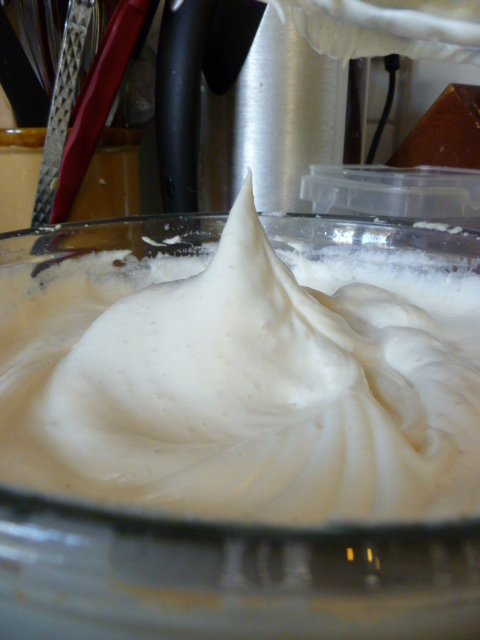 Whisk the egg white to form soft peaks. Put the sorbet mixture into a mixing bowl, and whisk it thoroughly to break up the ice crystals. Add a little of the sorbet to the egg white, and mix it in thoroughly. Fold the rest of the sorbet to into the egg white. Return to the container and freeze again. Check it after a couple of hours to see if the egg white has separated a little. If it has, re-whisk it. The sorbet will be ready after seven hours from when you added the egg white, but stores well for longer. Remove from the freezer 10 minutes before serving. This should be easy enough to make in an ice cream maker, too. I guess you will need to churn it for a bit, then add the whisked egg white, then churn again. Just follow the manufacturer’s directions for the rest. I am sure that you may have noticed by now that I use a lot of egg yolks – in stuff like custards, mayonnaises, pasta, pastry and sauces. This leaves me with a lot of egg whites to use up. Since I hate waste, I try always to use them, which invariably means making macaroons, and meringues. I need to expand this repertoire, so expect to see consommés and more stir fries appearing here soon. If you have other suggestions for using up egg whites (although not the egg-white omelette, please, some things are a step too far, even for me!) feel free to leave them in the comments. I had originally intended to make advocaat, in keeping with the Anglo-Dutch theme for my party, but I ran out of time. However, this time, the advocaat was actually the by-product of the intention to make meringues, instead of the usual situation where I have a load of egg whites left over from something else. No one missed the advocaat, anyway! Since I make them so much, I thought that I would share my technique here. I haven’t given a recipe, as it will depend on how many egg whites you have and to some extent how old they are. Start by heating the oven to 110°C. Then measure out 45 g sugar for each egg white. I like to use raw cane sugar, but you can also use caster, granulated or icing sugar. I have also seen sugar solution, but that seems to be for Italian or Swiss style meringues, and I tend to stick with French. It is possible to use soft brown sugar, but be aware that this makes it very hard to get a crisp, dry meringue. I think this technique may be best left alone or, if you insist, only use it to top lemon meringue pie. Put the egg whites in a very clean bowl. There must be no fat or detergent in it. If you are unsure, wipe it with the cut side of a lemon (or other citrus), which will act as a degreaser. If the bowl has any fat, it may affect the ability of the eggs to maintain the air that you are about to whip into them. The same goes if there are any traces of egg yolk, so be careful when separating the egg, too. Note that the fresher the egg, the less likely that the egg yolk is to break when you separate it. 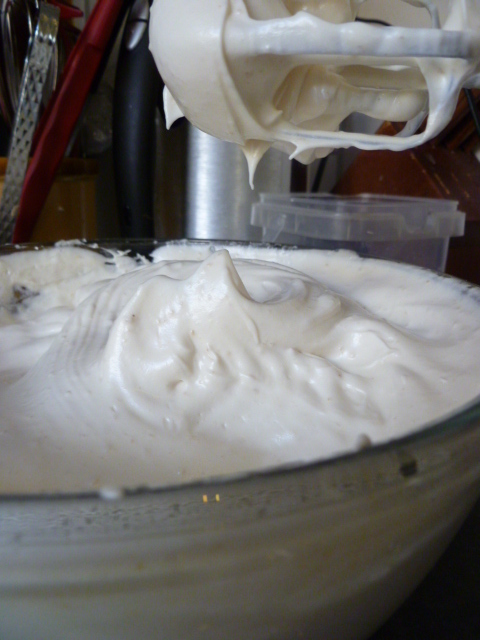 Next, whip the egg whites until they form stiff peaks. 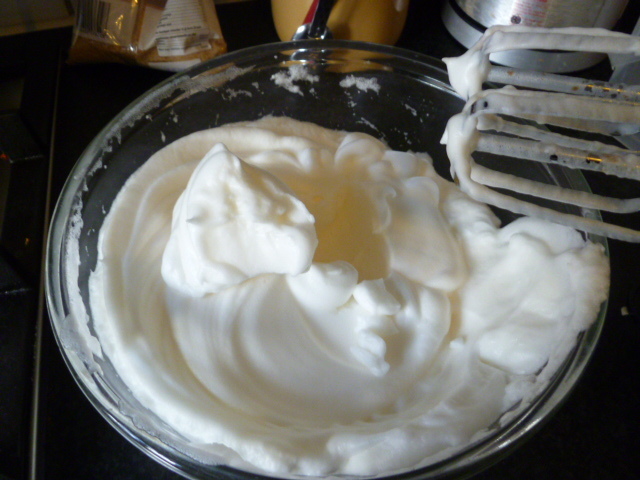 This is when the egg whites look drier, the whisk or a spoon will create peaks when you remove it from the mixture, and if you are brave, you can upend the bowl and the egg white will not slide out. I would advise using an electric whisk if you don’t want it to take you hours. Then, a tablespoon at a time, add the sugar and whisk in thoroughly before you add the next spoonful. The egg white will stiffen further, as you add the sugar. At this stage, you are beating to incorporate the sugar, not to add any further air, so it won’t increase in volume. Keep adding the sugar, and whipping, a tablespoon at a time. Eventually, the mixture will become really stiff, to the point of being really hard to work, and will look shiny. This is when you stop adding sugar. Because I use cane sugar, I find I need less than the stated 45 g per egg white. 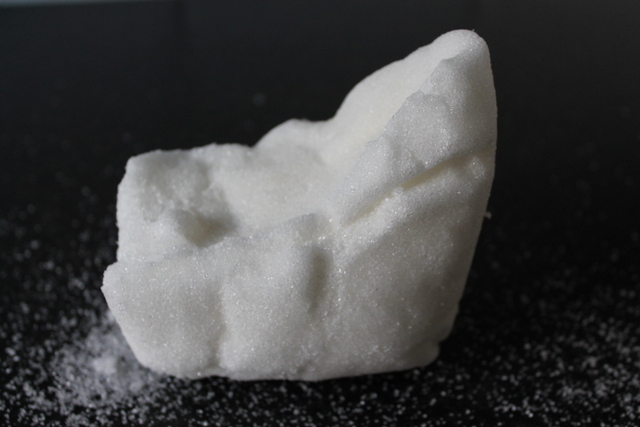 If you are using caster or icing sugar, you may find that you need to use all of it. This is also fine. Don’t add more sugar than needed to get to this stiff consistency (or than the 45 g, whichever happens to come first), otherwise your meringues will leach sugar. This does not really affect the taste, but it does give them a rather unattractive look. A bit like a tree that is leaching sap. Now your meringue is ready to be shaped. You need to line a baking sheet with some greaseproof paper. You can stick it down with oil or by dabbing a bit of the meringue in each corner and the centre of the paper and using this as glue to stick it to the baking sheet. Once the baking sheet is ready, you need to choose what shape and size you are going to have your meringue. You may wish to have it as a pavlova, in which case you need to shape one large disc, with slightly elevated sides, to hold the fruit in. I normally go for individual ones, because these are better for parties or for sharing. Most commonly, I will get two spoons and shape individual quenelles, which can then be stuck together with cream and fruit in a sandwich. However, I wanted to fill these with Chestnut Jam, so I decided that mini versions of the pavlova-style would be better suited to the task. Some people would use a piping bag for that, but I lack the finesse, and the piping bags, so I made do with shaping them with two spoons. You can try either, I think both are just as good. I made them vaguely circular, like a nest. Then it is ready to go in the oven. 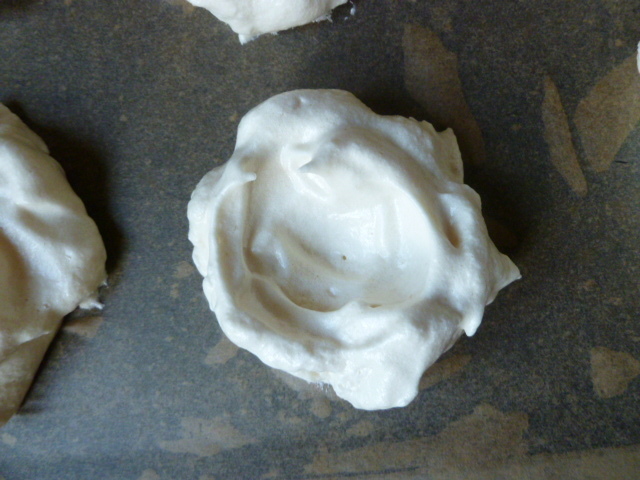 Bake the meringues for up to 1 ½ hours (but check after 1). If you have made one large pavlova style meringue, you will need longer – check after 1 ½, and leave in the oven up to 2 hours. 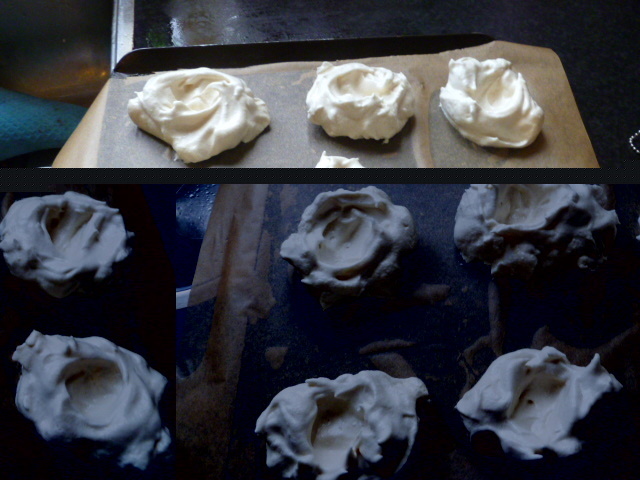 The idea is not really that the meringue cooks, more that it dries out. You need to check that it is no longer soggy to the touch, and that it generates a hollow sound when tapped very gently on the base.It will have darkened a little, even if you use icing sugar. Mine are generally more golden than off-white, because the unrefined sugar I use is a light brown. When you get the hollow sound, it is done. If it is at all possible, turn off the oven, but leave the meringue in there to continue to dry overnight. This will give the best result, but it will be OK if you leave it to cool outside the confines of the oven. Once it is done, fill it with fruit, cream, fruit and cream, jam, or serve it with ice cream, mash it up with fruit and cream to make Eton Mess – whatever you like, really.